The Ampex Model Master Maker 1100 Tape Recorder/Reproducer, refers to Ampex part no. 4010210. The standard model MM-1100 provides 16 channels of audio recording/reproducing capabilities, using 2-inch magnetic tape on reels up to 16 inches in diameter. Eight-channel and 24-channel recorder/reproducer systems are available on special order. Any machine may be converted to an alternate configuration (e.g. 16 to 24-channel) by installing a conversion kit. The MM-1100 provides the capability of recording on any or all 16 channels simultaneously, or of monitoring a previously recorded channel while recording in synchronization on additional channel(s). The selective synchronization (SEL SYNC*) feature is enabled by using the record head(s) of the prerecorded channel as playback head(s). The MM-1100 recorder/reproducer consists of a tape transport assembly; a transport control assembly, a frame assembly; a motor drive amplifier assembly; a head assembly; four electronics assemblies for 16-channel systems); a control box assembly; va meter panel assembly; two power supplies; a fan assembly; an external connector panel assembly; an input/output adapter panel assembly; and a circuit breaker assembly. Connectors are used extensively between units to allow easy removal of components and assemblies. The tape transport assembly consists of	supply and takeup reel assemblies; a capstan drive assembly; a	capstan	pinch roller assembly; a tension sensor assembly; an end-of-tape arm	and housing	assembly; a tape lifter assembly; and an optional tape timer assembly; Also mounted on the tape transport, but not considered part of the tape transport, are the erase, record, and reproduce heads comprising the head assembly. Foundational text courtesy of AMPEX Corporation. 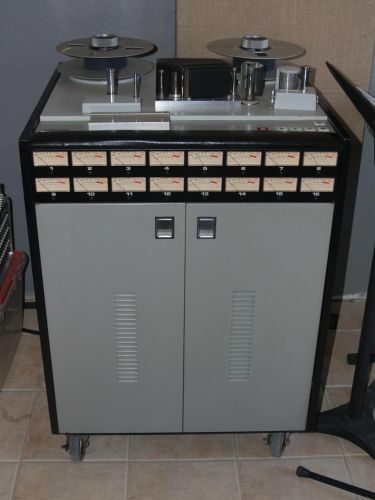 Do you have content, to add, about the Ampex MM-1100 Tape Machine or associated topics? Please feel free to Share it, here!